Package Include: 1 x Squeeze horn bell. Unique style, easy to install, loud voice. Bicycle indispensable equipment, economical and practical. This horn bell is made of plastic. The Gasbag is non-toxic silicone, durable, deep and loud voice. we believe in our products. That’s why we back them all with an Lifetime warranty and provide friendly, easy-to-reach support.High quality rubber horn,no unpleasant smell,metal horn smooth color plated,sound clearly and loudly. 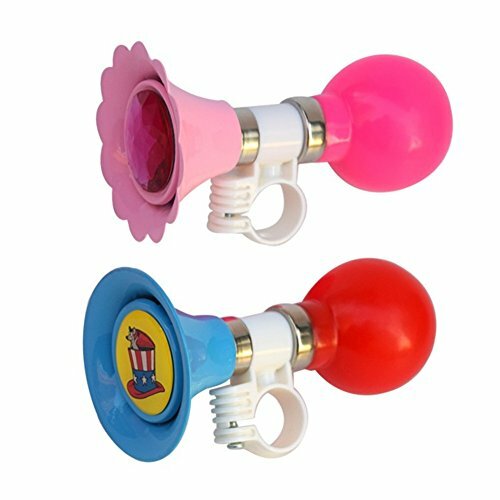 Clear sound with a distinctive honk by squeezing the rubber ball on the horn, the unmistakable sound lets everyone know you’re coming. Easy to install, just need a screwdriver,works great on a bike trikes or scooter, anything with handle bars that handlebar diameter is about 70mm. Please contact with us anything problems,12 months warranty and friendly customer service. For ages 4 and above. Fits most bikes, trikes and scooters,squeeze the rubber horn,the funny amazingly loud lets everyone know you’re coming.